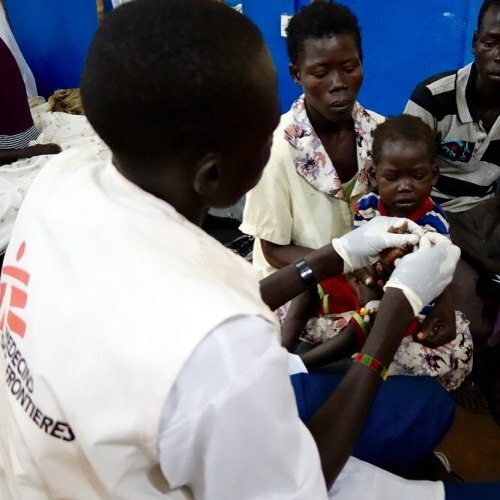 “Three-year-old Ajeth sits in her mother’s arms as a South Sudanese medical staff pricks her finger to test the child’s blood iron. Ajeth was admitted to the hospital three days ago in severe condition with complex #malaria. She was suffering from high fever, anemia and diarrhea. #MSF staff treated her with an injectable malaria treatment, an intravenous drip for rehydration and a blood transfusion to stave off the anemia. Now Ajeth is doing much better. The malaria has subsided and the blood iron test is good. She is ready to go home. Her parents do not have money for public transport so MSF gives them high-energy biscuits so Ajeth will at least have food for the long trip. It’s an eleven-hour walk. “Last year, my son had malaria too, so I also brought him to MSF,” the mother explains. “In our village, the issue of malaria this year and last year is very serious.” © Jacob Kuehn/MSF” By doctorswithoutborders on Instagram.